Posts are a few days behind because the internet has been down here at the Asa Wright Reserve. We seem to be unable to function today without the internet! But Aunty was lucky, as there were a lot of other people I could bore here in the lodge in the evenings. The other night the evening activity was a night walk along the road to see what we could see, or in my case what we could trample over in the dark!. And when I say dark – boy it was dark. There were five if us on the walk, but only one torch between us, and the ranger was not letting go of that. Aunty stayed behind and so I was free to ask all the stupid questions I could about what we saw. Everywhere you go here in the forest there are huge leaf cutter ant nests, and the trails they make across the forest floor are so clearly defined they look like animal trails. However, it’s not until it gets that you start to appreciate the shear number of ants there are here. The photo above shows a trail of ants along the edge of the road bringing back the leaves from a nutmeg tree just behind. Everywhere we went during the walk there were thousands of ants. We went down a set of steps to find a Trinidad Chevron Tarantula, and all along the right hand side of the steps there was an leaf cutter ant trail, but I didn’t find this out until a little too late. As we came to where the tarantula was hiding I started to feel things crawling over my feet. Being the fool I am I had gone out in flip flops as there wasn’t time to put my boots on. “You’ll be OK the guide said!” Not I ******wasn’t! I managed to get a photo of the tarantula in between dancing around like a demented Austrian doing a Tyrolean dance. Mind you I had the last laugh. Everyone else was covered in ants up to their waists because they hadn’t felt the ants in their boots! No the ants weren’t wearing boots – work it out. 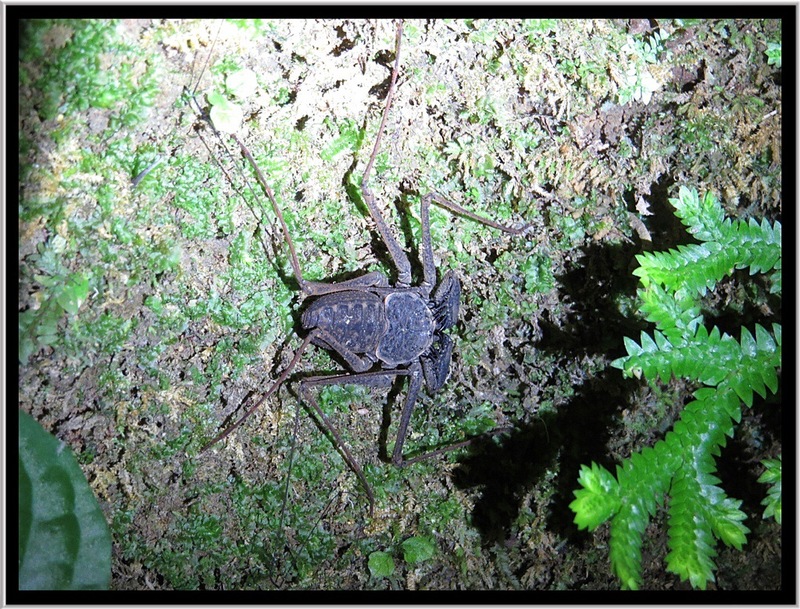 Back on the road again we came across a whip scorpion. These chaps are not true scorpions or spiders but are a separate order of Arachnids. The ‘whips’ of tail-less whip scorpions or whip spiders are a pair of very long specialised legs that they use like antennae. They are useful for feeling and sniffing their way around and finding food and mates. These delicate legs are often damaged but can grow back when the animal moults, shedding their old skin and forming a new one. That was my favourite of the evening until we came across a velvet worm. I’ve wanted to see one of these since watching an episode of Life on Earth with David Attenborough. They are soft bodied worms with legs – that’s the easiest way I can describe it after watching this champ tonight. They have a fairly gruesome way of eating by laying in ambush and then covering their prey in slime to stop them escaping. Following up by an injection of saliva and sucking the poor unsuspecting prey dry. Fantastic. Just below the velvet worm on the back was a handsome long horn cricket. 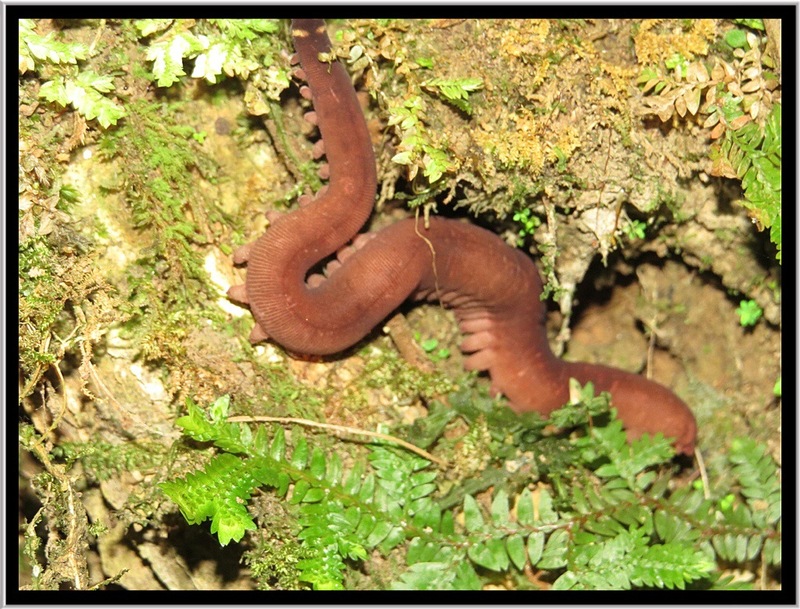 Which if it wasn’t careful could be the velvet worms dinner for the night. It was time to return back to the lodge. But the excitement hadn’t finished yet. 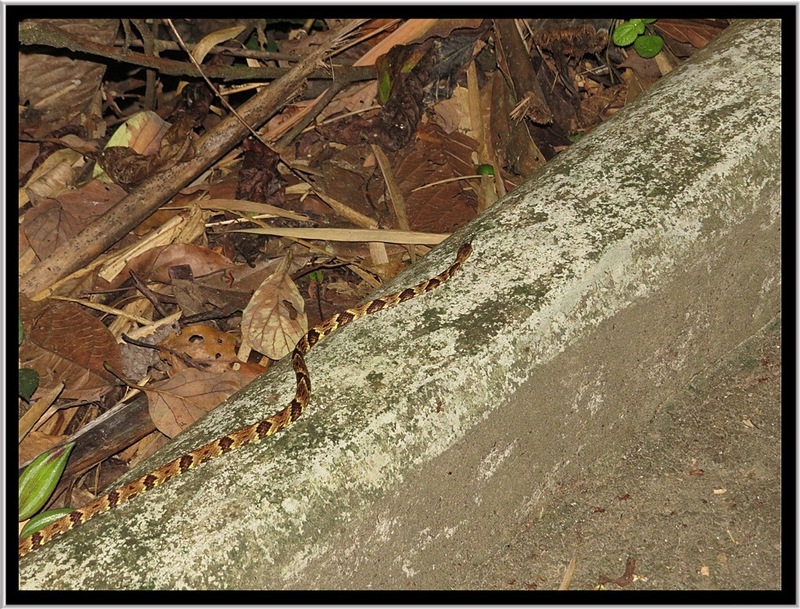 Crossing the road in front of us was a beautiful snake, that may have been a pit viper so we all kept our distance. It was quite happy being followed and posing for photos. When we got back to the lodge and looked at the photos the general consensus from the guides was that this was a Snail Eating Snake. Even so it was great to see it. Despite the excitement with the snake, my favourite is still the velvet worm. If only because they are not often seen, but also down to its gruesome eating habits. 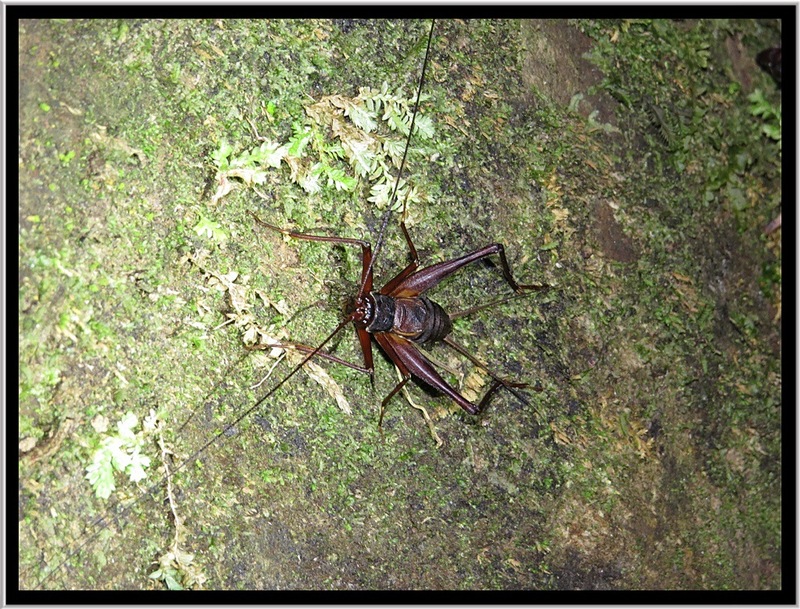 Then closely followed by the whip scorpion. 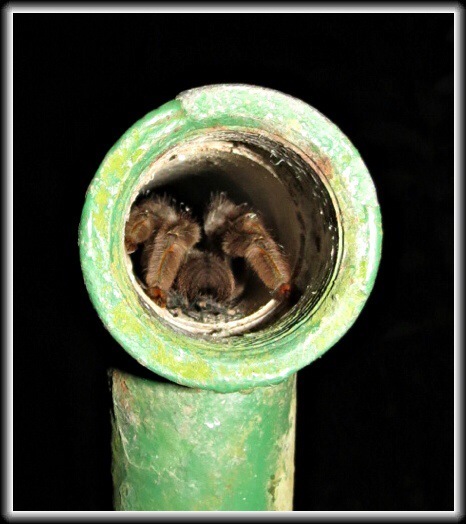 Though after seeing where the tarantula was hiding I certainly not going to poke my fingers into the ends of the pipes used for handrails! Oh, and next time I’m going to make sure I wear boots. Fascinating Paul but not surprised u were on it own if u wear boots next time what will u use for an early warning system in case of ant invasion? I’ll have to put my thinking cap on for that one! Previous Previous post: Trinidad here we come!